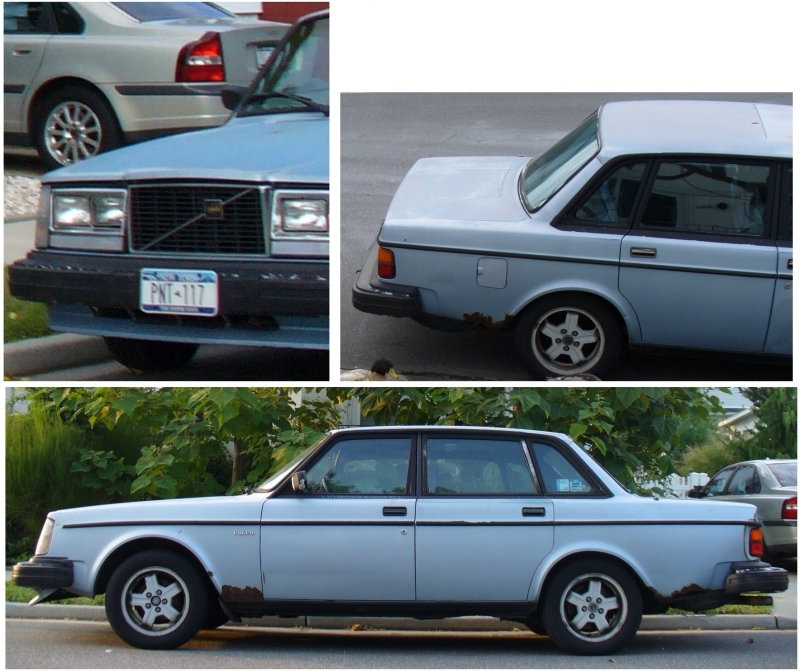 View Poll Results: Why do you think this Volvo was stolen? Why would I be paying a $5,000 ransom for a rusty little old car worth no more than $500, you ask? Because it's my wife's "rusty little old car" that's been carnapped! Well, actually it's been stolen! Without a ransom note, I guess it can't really be called napping. Can it? But who would choose to steal an old stick-shift car like this one over newer cars in the same unprotected lot? I'm still trying to figure it out. 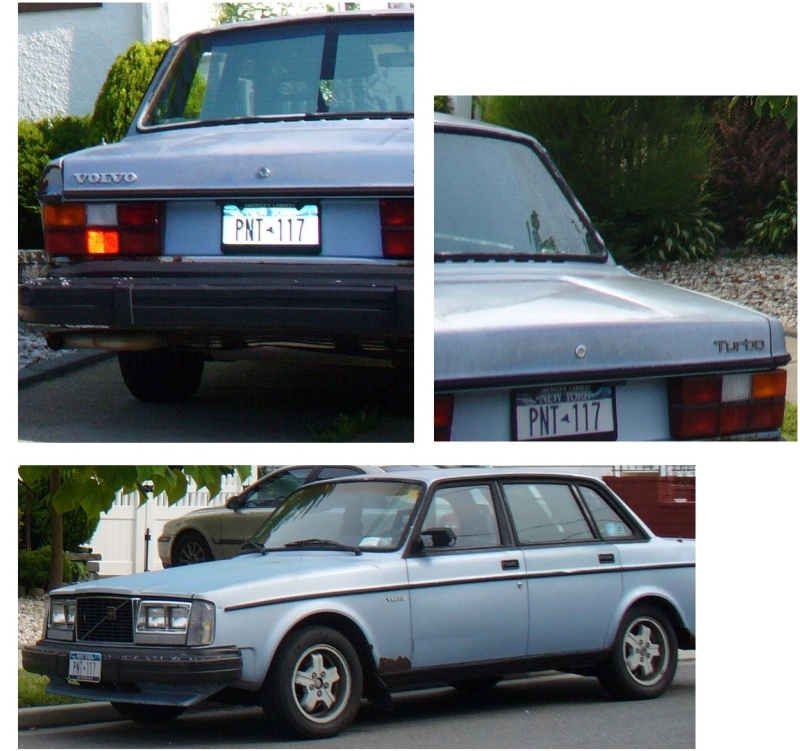 Why would my wife's rust bucket of a car, her 1982 Volvo - yeah, that's not a typo - why would her 1982 Light Blue Volvo Turbo (techinically a 244 DL with included turbo unit and five-on-the-floor stick shift - the fifth gear stopped working nearly 17 years ago, along with the odometer - it still reads 159,000 miles when it's got at least 340,000 miles on it) get carnapped/stolen (sometime between 9:00 PM and 8:30 AM this last Tues/Wed , 8/16/11 - 8/17/11) from the Under the Hood Auto Repair Shop parking lot (on the corner of Verity Lane and Atlantic Avenue, Baldwin, NY 11510 - Nassau County, Long Island - in case anyone wants to Google Earth the location) which parking lot, by the way, was filled with way more valuable Hondas? I could understand if the Volvo was some sort of showpiece, or had some valuable parts to sell, but her car really IS a rust bucket. Nothing on it is worth a dime. A while back, a mechanic told me I'd be punching my foot through the floor one day because of all the rust. True, it still carried me and my wife around our neighborhood, for food shopping and such, but just barely. And true, with only four cylinders it hardly uses any gas. And true, it DOES have sentimental value for ransoming. So why no ransom note? I really would pay $5,000 to get her car back. And true, I know it's worth only about $500 (if you count the four two-year old tires). So, can a $500 rust bucket of a car really get ransomed for $5000? I guess so! That's the problem with sentimental stuff. If I were a multi-millionaire, I'd pay even more to get it back. But $5,000 would be the absolute limit of what I could afford right now. Even if my wife and I DO have alot of "tender memories" attached to that car. We bought it brand new way back in 1983 from Volvoville of Amityville, NY for $16,000. We had money back then. Both working and all. We're retired now. Living on pensions and social security. We probably should just buy something newer with $5,000 but we really can't bring ourselves to pay $5,000 for somebody else's used car. Not with our current income, at any rate. Not when we could just as well buy somebody else's used car for $500 or even $1500. Only our little old rust bucket of a car is worth $5,000 to us. Shows you what foolish things people will do for the sake of sentimentality. So why don't car thieves think of this when they steal really old, rust bucket cars? You'd think they'd say to themselves, "The owner of this car is spending thousands of dollars to get this car repaired when it's not worth even $500 - it must have a whole lot of sentimental value for him or her or them - let's take it and ransom it." But no, they don't think of that. So they don't ask for any ransom. They probably just sell it as a junk car. Car thieves have no imagination. Hope you find it. Still you would think a thief would go after a common car, not a stick in the stone Volvo 240.